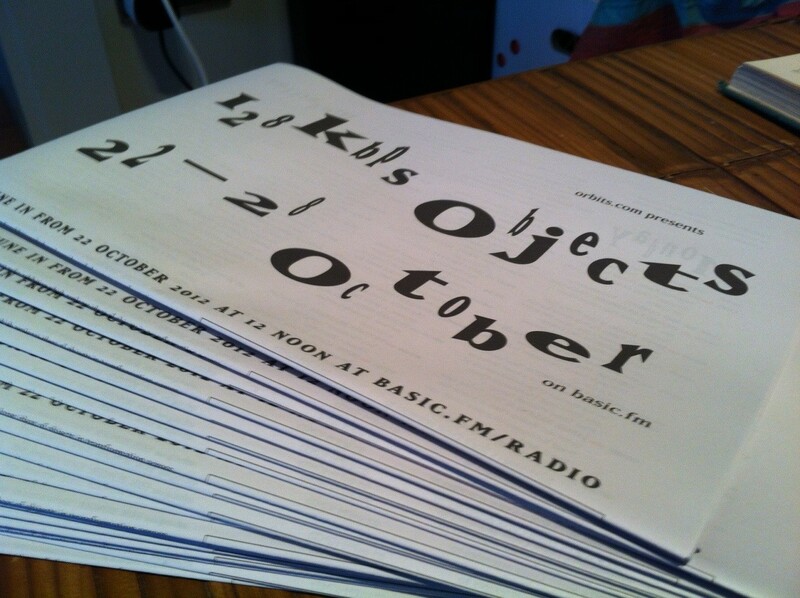 This is an edited version of 128kbps objects radio exhibition first broadcast on basic.fm in October 2012. This version of the original 60-hour show has been put together for Grand Union‘s participation in the gallery project Floor Plan for an Institution: The Gallery at The Meter Room in Coventry, UK. 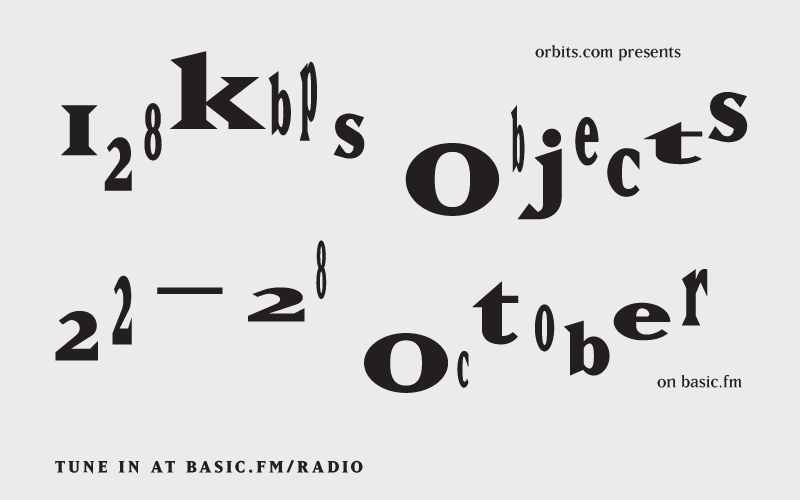 Over the course of 12 hours from 8AM to 8PM GMT, both on the internet radio basic.fm and at The Meter Room, the audience will be listening to a combination of sound works, readings, music and playlists that responds to the theme of The Gallery; what a gallery might be and how objects might be displayed and experienced within it, outside it, or in-between. A—Z, Angus Braithwaite, Helen Brown, Rob Canning, Daniela Cascella, Osvaldo Cibils, Patrick Coyle, Beth Collar, CuratingYouTube.net [CYT], Tim Dixon, Steven Dickie, Benedict Drew, Anne Duffau, Extra-Conjugale, Claudia Fonti, Jamie George, Graham Harman, Emma Hart, IOCOSE, Juneau Projects, Irini Karayannopoulou, Scott Mason, Tamarin Norwood, Sara Nunes Fernandes, Ciarán Ó Dochartaigh, Chiara Passa, Radiomentale, Yannis Saxonis, Salvatore Sciarrino, Richard Sides, Maria Theodoraki, Simon Werner, Richard Whitby. At 8PM, at The Meter Room, artist Scott Mason will present “of a final account in formation”, a live DJ mix formed of room-tone recordings he has undertaken at exhibitions around the UK. The essential sonic documentation mix, bringing you a survey of the hottest exhibitions nationwide. For more details about Floor Plan for an Institution: The Gallery project, which is curated by Grand Union, go to The Meter Room website. Claudia Fonti: 128kbps Ident will play in between the works listed above. More details about each piece can be found by browsing the archive of the original exhibition on basic.fm. Announcements voiceover and sound by Jenny Hodgson and Kieran Rafferty. 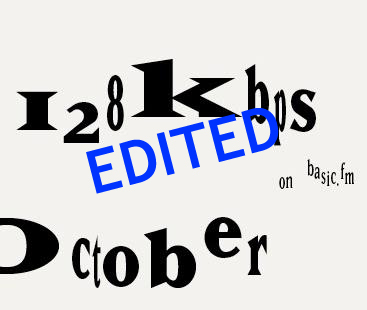 128kbps objects original project was supported by Arts Council England in partnership with basic.fm. The broadcast of this edited version is supported by Grand Union and The Meter Room.